The TV, magazines and billboards are plastered with them: advertisements for products that claim to minimize fine lines, provide a facelift in a bottle, and generally create an illusion of winding back the clock so that we can reclaim our lost youth. But are those buckets of money and hours spent peering into a magnifying mirror really worth it? Wouldn’t you rather that dewy complexion came from inside, rather than from a serum you have to apply twice a day? The good news is that foods and natural remedies can go a long way toward creating a youthful look, by enhancing the elasticity of skin, making hair thicker and shinier, encouraging eyes to be sparkly and clear, and bringing a rosy glow to one’s complexion. There is even anecdotal evidence that certain foods can turn grey hair back to its natural color. All of these foods are best used preventatively, but it’s never too late to take action. As a side bonus, you’ll feel younger and more vibrant as well! Without further ado, here are the top 10 foods for a fresh and glowing appearance that will look great on you, no matter what your age. It’s no surprise that colorful fruits like blueberries, pomegranate and watermelon are practically bursting with health-giving, youth-promoting properties. Blueberries are amazingly high in antioxidants, which protect cells from everyday damage — from the sun, environmental toxins or stress. Pomegranates boast ellagic acid, a compound that fights free radical damage, and punicalagin, a nutrient that helps preserve the elasticity of collagen. Both of these phenols help keep skin firm and elastic. Watermelons serve up vitamin C and lycopene, both potent antioxidants that promote a glowing, dewy complexion. Try eating at least half a cup of one of these anti-aging fruits each day. You should try to consume at least one cup of spinach, kale or swiss chard daily to see anti-aging benefits. These nutrient-rich foods also keep eyes bright and white, and help to slow mental aging! Inflammation is a process of small-scale cellular damage that can really add up over time. Cosmetically, inflammation can show up as off-color skin, whether it appears dull and lifeless or red and irritated. Cold-water fish are rich in omega-3 fatty acids, which are one of the prime nutritional weapons against inflammation. Try eating at least three palm-size servings of oily fish like wild-caught salmon, mackerel, sardines and herring each week to fight redness and keep skin looking plump and healthy. Carrying on from the previous point, there are plants that contain good fats too. Think olive oil, avocado and coconut oil. These minimally-processed natural fats are super anti-inflammatory and are considered partly responsible for the lack of age-related disease in island nations. They keep cells healthy and protect against oxidative damage. All of this adds up to skin that looks as great as it feels. Shiny, thick hair is also a result of ample consumption of healthy fats. Aim to eat a couple of tablespoons of good fats with each meal. Probiotics improve digestion and detoxification, which leads to clearer, more nourished skin. Good gut bacteria improves immunity, which helps fight off infection and illnesses that can leave you looking aged. Probiotics improve mood and resiliency to stress, which helps you smile more. Everyone looks brighter and more youthful with a smile on their face! Try adding at least a quarter of a cup of fermented or cultured food to your daily diet. Some good choices include high-quality yogurt, kefir, sauerkraut, kimchi or kombucha. Aren’t you pleased to see this one on the list? Yes, good-quality dark chocolate is an anti-aging food. Why? Because it’s rich in flavonoids that help preserve the healthy function of blood vessels. Good circulation means that all of your muscles and tissues get the nutrients and hydration they need. And that means you keep looking fabulous. Enjoy two to four squares of chocolate daily, provided it has at least 70 percent cocoa content and is made from natural ingredients. One scientific study found that those who eat nuts on a regular basis live an average of 2.5 years longer. This is likely thanks to their concentration of vitamins and minerals, plus ample amounts of good fats. Stick with raw organic varieties and avoid those that are packaged with unhealthy oils like soybean or sunflower oil. Have you ever considered collagen injections for lackluster lips or sagging skin? Think again — this simple superfood is the best whole source of the proteins that keep things bouncy, supple and youthful. Boiling any bony, sinewy leftovers overnight with water and a splash of vinegar will result in a delicious broth that can be used as a base to any dish. You can also drink it warm as an alternative to tea. You will be rewarded with a glowing complexion, shiny hair and healthy nails, plus flexible smooth-moving joints too! Drinking a variety of teas is one of the best ways to massively dial up antioxidant consumption. Green tea and rooibos (redbush) tea are some of the best choices for a significant dose of antioxidants called catechins. These reduce hyperpigmentation and other signs of skin damage. Try starting the day with a cup of green tea (which contains caffeine), then switching to caffeine-free rooibos later on. While garlic, ginger and cinnamon should certainly be included in your diet on a regular basis, turmeric and cayenne pepper are the best anti-aging spices. Turmeric is a powerhouse against free radical damage, helping to fight inflammation and shutting down disease before it starts. It also encourages the body to produce its own endogenous antioxidant compounds. Cayenne pepper promotes healthy circulation and oxygenation of the small blood vessels that permeate our tissues, so that they can remain nourished and elastic. Try eating at least a quarter of a teaspoon each of these youth-promoting spices daily by adding them to teas, smoothies, curries and soups. We encourage you to ditch those overly expensive, toxin-toting creams and serums. Instead encourage vibrant health and youthfulness from the inside out. Simple changes will bring results within days! Learn more about an anti-aging attitude to complement good nutrition. Next articleCher Donates Water Bottles to Flint, Michigan, but Is It Really Helping? Hey Buddy!, I found this information for you: "10 Anti-Aging Foods to Start Turning Back the Clock Today". 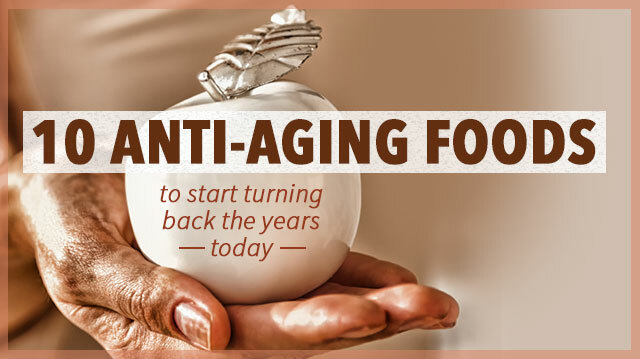 Here is the website link: https://www.thealternativedaily.com/anti-aging-foods-turn-back-the-years/. Thank you.